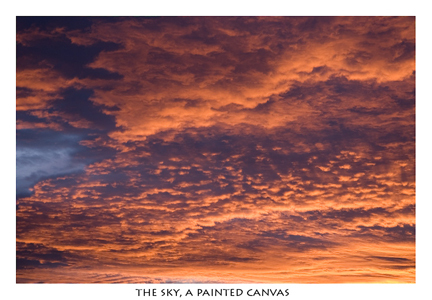 There are sunset's and rises in the lowlands, but I usually don't see them. It is in the mountains where they blister my memory. 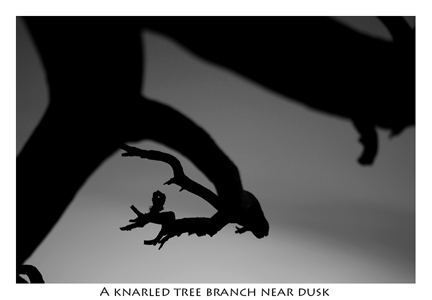 With the camera so often in my hand, the sight of any sunset or rise has become a prize I am disappointed to miss out on. During fast day trips, there is little time to take pleasure in the quiet sparks and flames the sun emits. During a long workweek, a noisy drive home, or a lazy afternoon cleaning the house, these colorful moments remind me that these days are just the between separating me from my home away from home, my mountain theater, and there's no keeping me away. Not even when laziness curls up in my comfy head and whispers sweet surrenders. Getting into the car was the hardest part. 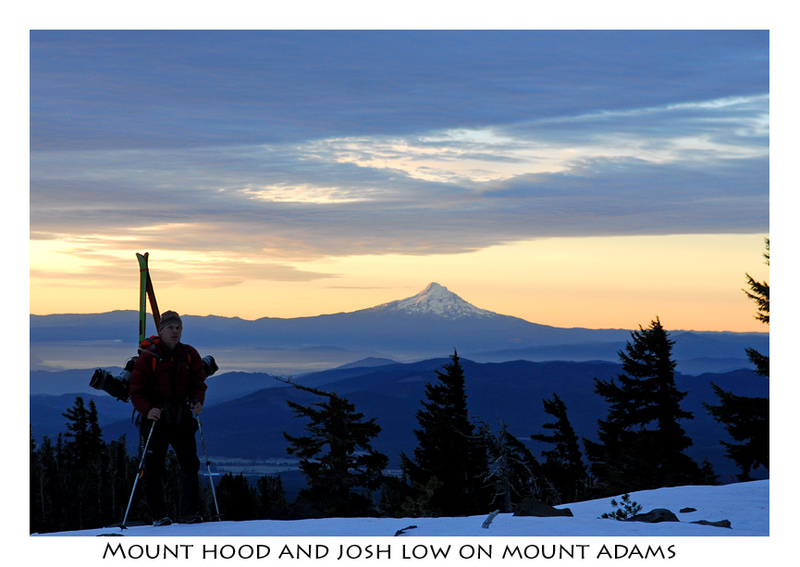 Once on the road, with my brother joining, we were racing for Mount Adams. A drizzle or two was smitten by a curious sun whose rays peeked through pockets of blue. It was several hours along rough roads before we raced up the final section of road to the South Route trailhead. There appeared a few logs which we were afraid would stop us, but we later learned that hunters had cut a few logs. The remainders required a small bit of 4x4ing. In a race against darkness, Josh and I motored to camp. Fifty minutes later, with the sun mostly down, we had camp set-up in a familiar place. When we were younger there were many, many nights spent in exactly the same spot. I went to see if our seats and card-playing area, set among flat rocks on a knife ridge was still there beneath an old krumholtz of a tree. I was dismayed to find it gone, although, most of an hour watching Mount Rainier and Adams squirm under flaming clouds, made up for it. 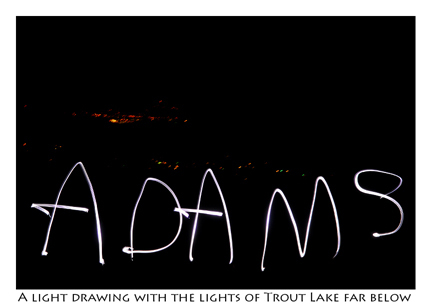 When darkness came, Josh helped me paint "ADAMS" in the night's sky with the lights of Trout Lake below. It took several tries before we managed to get it right. You see, with a 25 second exposure, you need to write the words backwards and get it done in the time and space provided. It isn't easy, but if you are in for a bit of fun to pass the time, give it a try and sent me your efforts. I'd love to see them! 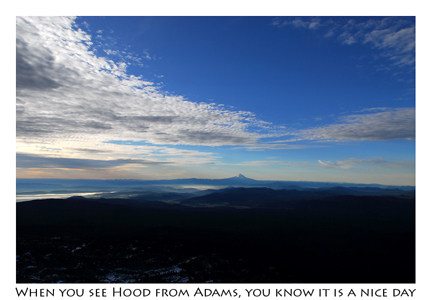 Familiarity with Mount Adams allows time to relax and not worry. Only at times I've spent many days in the hills, is there this calm. For once it was here, on a weekend, with time to hang onto it. Worth recounting are these moments because they are easy to forget and like photography, words can be as colorful, even if all that is seen is curves and outlines of dark hills and spiky edges of the trees that line them. What caught me most is something I want to share - a simple thing really. 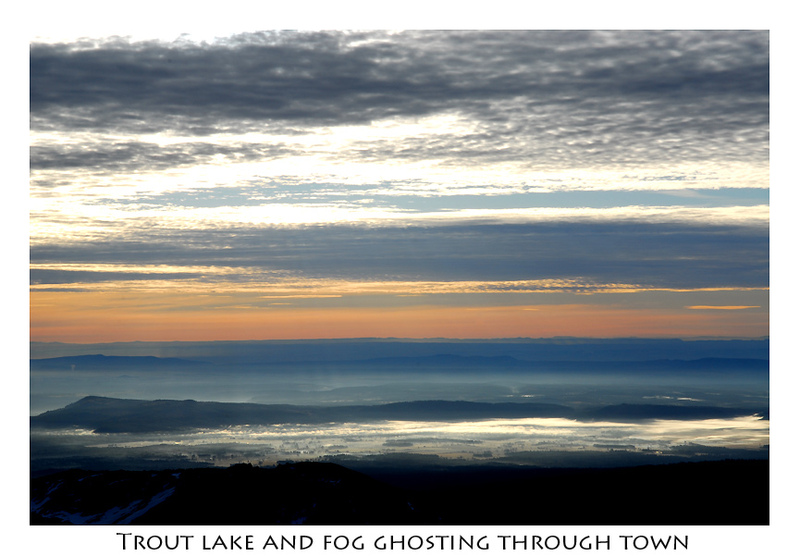 There, from my vantage, I was not drawn to the stars since they were being swarmed by fog and cloud. It was the valley breathing as if alive, like a runner who had just let up, hands on his knees bent over in exhaustion or a massive creature in a restless sleep. For a time I swore it was a river, cause it couldn't be the wind? And yet it was, bits of breathy sound echoing from the valley thousands of feet beneath me. 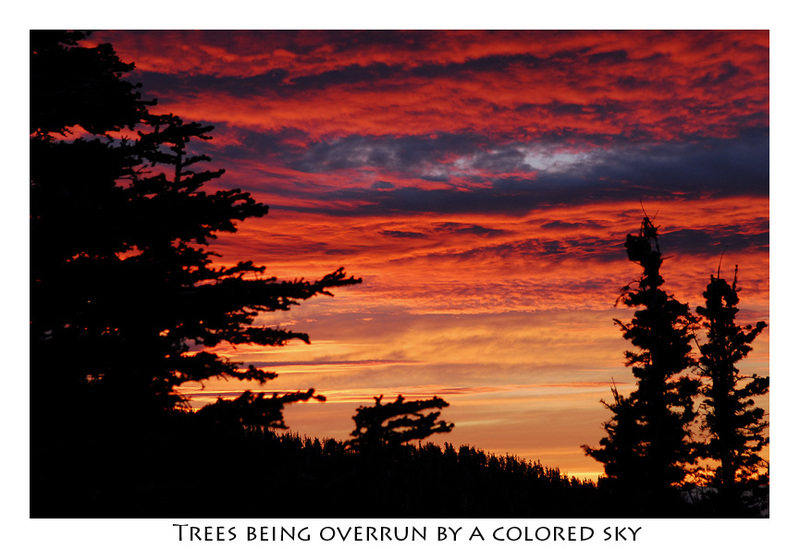 A good night's sleep was interrupted by colors brushing the horizon in pinks, blues, oranges and reds. Before, I hadn't mentioned much of the sunset, because it was a disappointment. 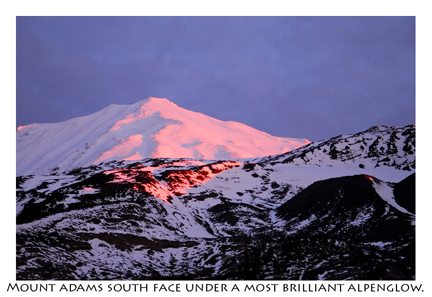 The sunrise, on the other hand, was far from bashful and was revealed in all her splendor on the easterly flanks of Mount Adams. It was certainly a bummer to have to gather my gear up and leave my gazing for later. Chasing the alpenglow up the slopes wasn't too much of a letdown, though. 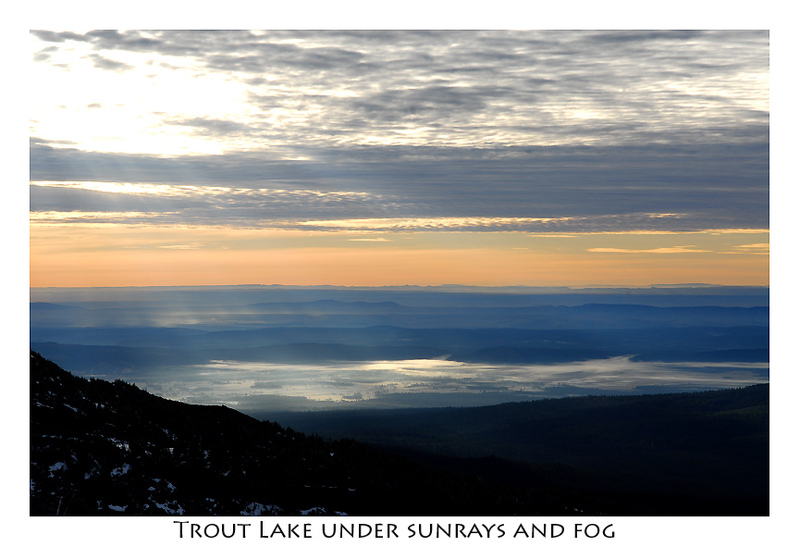 Down in the valley, smoke from burning piles of wood slithered through city streets and forests, and above the pinkish-white and blue colored patches of sky was made all the more brilliant by the sunrays fanning out through the entire scene. A familiar path took us up to the top of a ridge that snakes up toward broad snowfields and Lunch Counter. It was so often that I was stopping to take photos that my brother was beginning to get very annoyed with me, but the view was simply amazing and I was frustrated in my inability to capture it to the extent that it was moving me. But perhaps I won out? 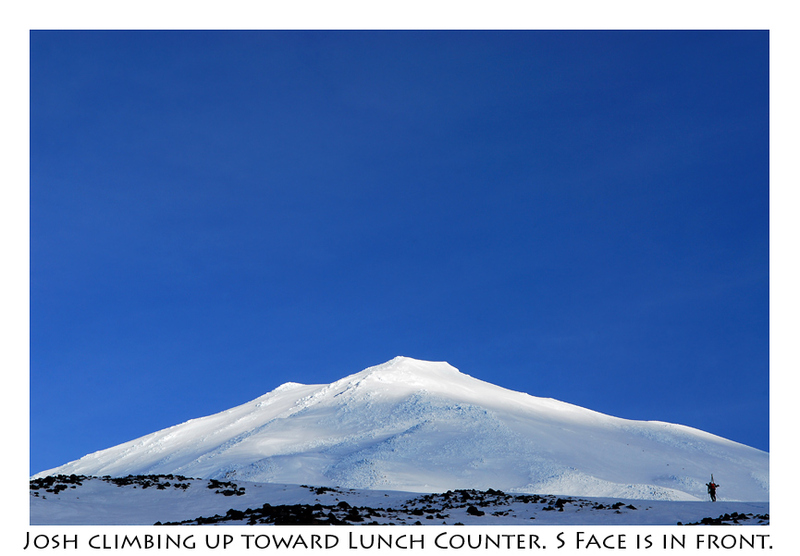 The climb from Lunch Counter to the false summit left everyone else behind. 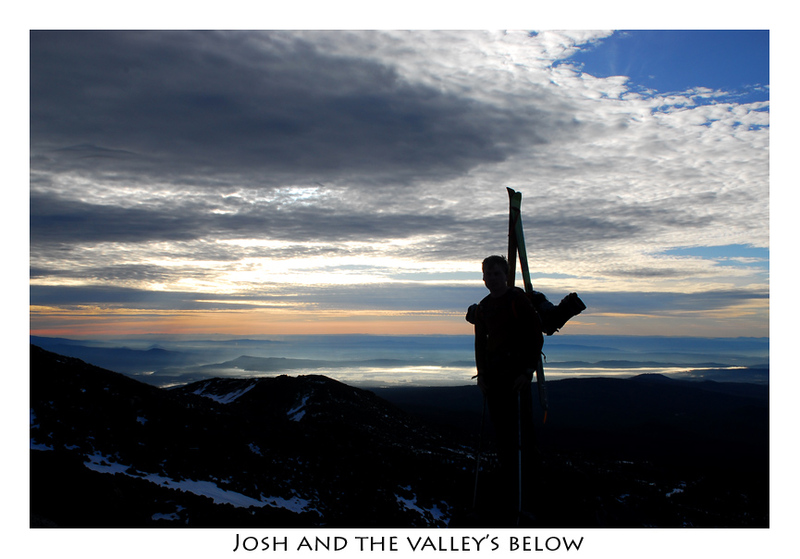 It wasn't until we were halfway up to the false summit that we realized we were being chased, and losing. 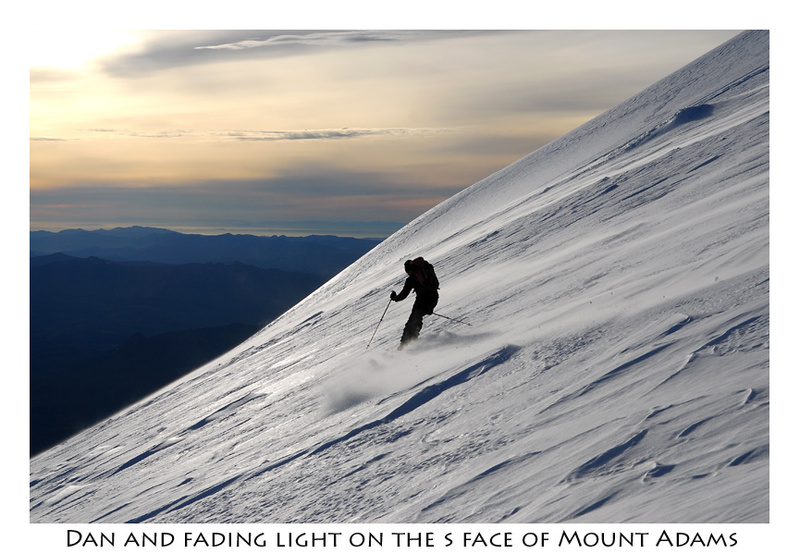 Earlier we had seen a skier, but then he had disappeared; now he was back. 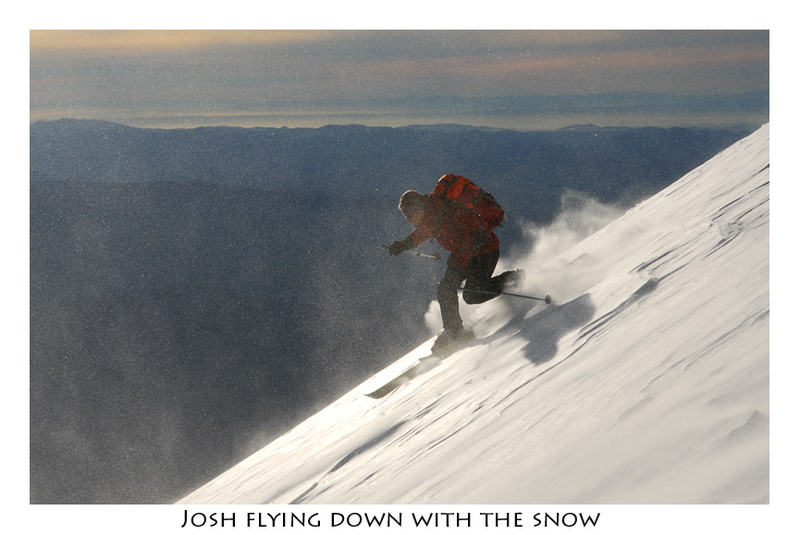 At Piker's Peak, I stepped down to get a photo of the skier and had wondered, "Is it someone I know?" It turned out, Dan Helmstader was the guilty party and we indeed knew him. 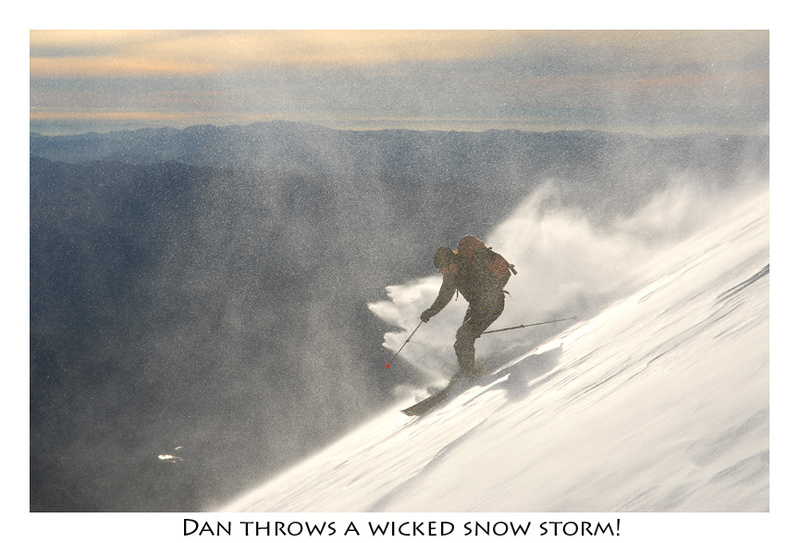 Dan's a classic dirtbag skier who's got his priorities pretty much figured out. 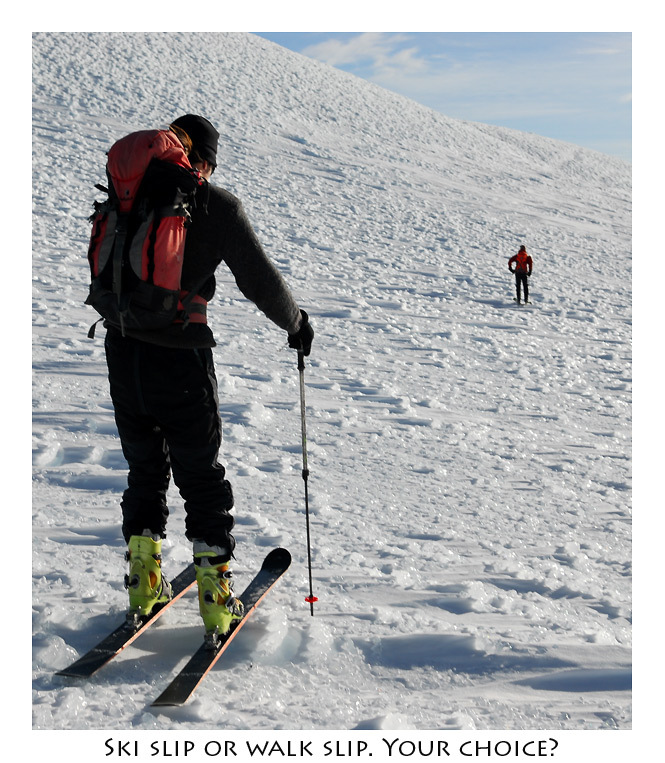 Every day he asks himself, "Is this a good day to ski?" If it is, he's skiing and that's a damn fine way to go in my opinion. 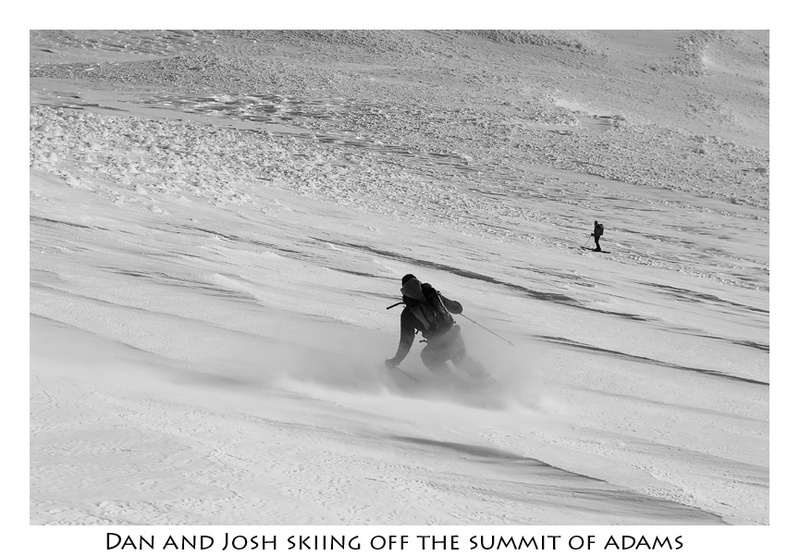 We all discussed going to the summit, as wind was picking up and the skiing was far from optimal. 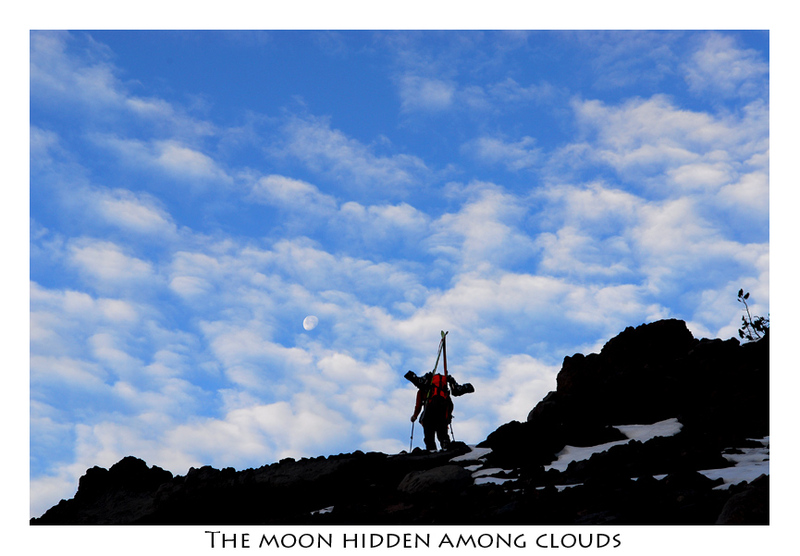 Between us and the summit were chunks of ice frozen into lumps that appeared much like a field of squash would. Yes, the joys of fall skiing at their best! We were somewhat overjoyed at the prospect of a summit. 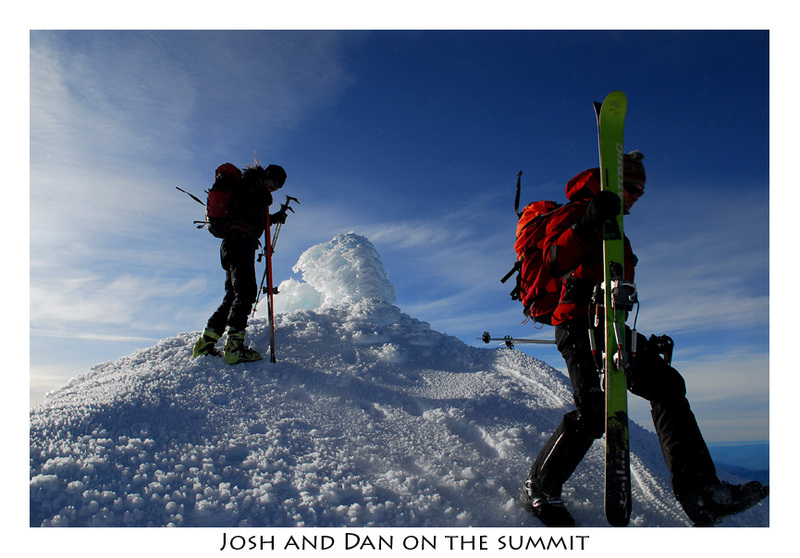 Some minutes later, we were on the summit long enough to catch a drink and lock the feet into skis for the descent. It was chilly! 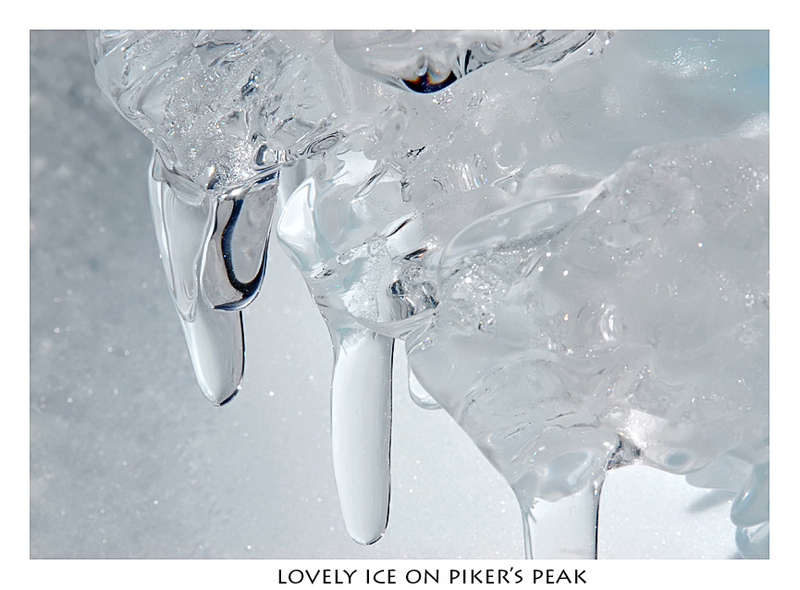 The skiing was terrible from the summit to Piker's Peak and not much better from there. The icy snow would gather up and throw itself down the slope and cover me while taking photos. 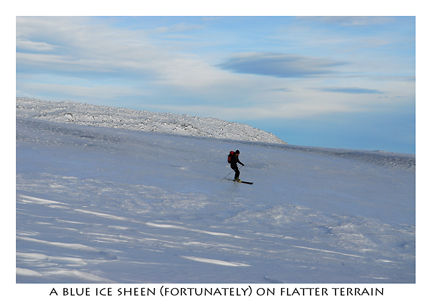 Our legs were rattled to jelly until we reached flatter slopes. No more than a few hundred feet below there, the snow softened to wonderful corn. In the sun Dan, Josh and I lay in the snow and gulped in the joy of a wonderful day on the mountain. The remainder of the ski was no letdown either. It was fantastic! Once back at the car, with darkness settled we separated ways with Dan and reversed our drive back to the city while Dan headed south, certainly for more skiing in the day's to come. 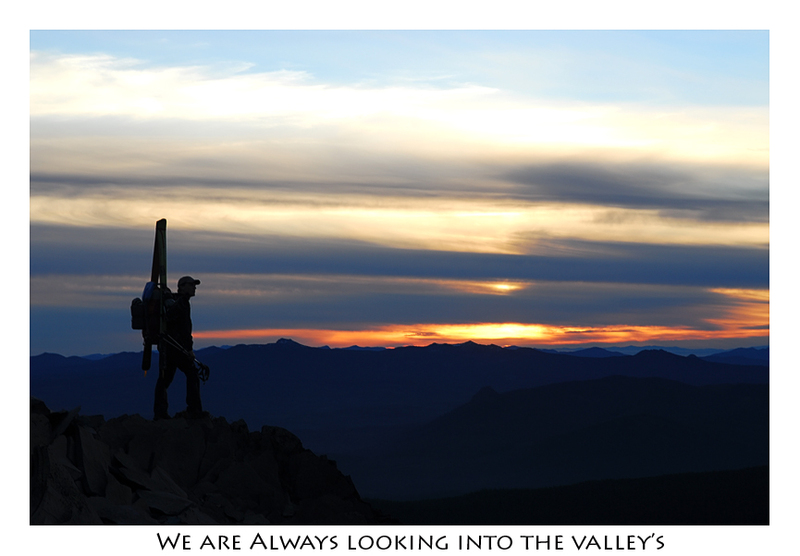 We were jealous, but I'll remember the sunset and rise, the breathing valley and the relaxing climb. Everyday in the mountains leaves me with more than I had come with and each time I go there, I try and come home with just enough to keep me satisfied until the next weekend (mount shuksan).